Namnathan (45) has a wife and four children. He ran a small business sharpening knives. It did not bring him a steady income as his machine was old, needed expensive repairs constantly, and could only sharpen kitchen knives. With help from the church, he was able to buy a better machine that can sharpen larger tools – sheers and cutlasses. He is now able to make a steady income to support his family. Puvanenthiran (60) has a wife and six children. For the past year, he had been unemployed, following an illness. Although back to good health, he is unable to get suitable employment. So the church provided him with a push bicycle, weighing scales and weights to enable him to start work as a fish vendor. He can buy fish from the fishermen returning from sea with their catch, pack them in ice in the box fixed to the back of his bicycle, and then sell them from door to door. Now he can care for his family. Thurainayagam has a wife and two daughters, both of whom are married. In 1991, during the civil war, he was injured and lost the use of his legs and his wife has to support the family. They were given a small goat herd to provide an income from goat’s milk and breeding. Vijitha (26) is married with three children. She has had a very hard life and has been in a violently abusive marriage. Once her husband tried to burn her alive. Amazingly, his behaviour improved and they started attending the 6 Mile Post church. They were allowed to live in a house belonging to the church. In exchange, Vijitha does some work in the kitchen and her husband carries out some odd jobs for the church. 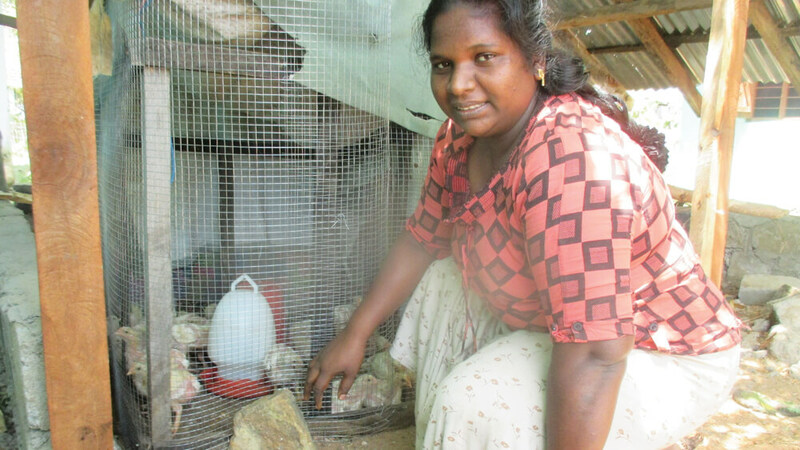 They’ve been given help keeping hens to supplement their income.